After getting the woodstove in the basement refueled with wood and bundled up for outdoors, the first thing we did was look out the windows in disbelief. We walked our front yard to access the damage. This is always a good first step following a disaster like this one, providing there are no live wires in the area or nearby. Luckily many weak locust trees located along our long driveway, once adjacent to our power lines, had been recently taken down by our neighbors after our August tropical storm. The timing was very useful for they surely would have crashed onto the power lines again with this new storm, and possibly onto our neighbor’s house. We were thankful. Our lines were still attached to the house and poles. Returning to go see our back yard, as we guessed, a big limb from our maple tree on the southwest side of house, which provides perfect shade in the summer on our deck, had partially crashed onto the edge of our pool. Another limb from an oak tree crashed on the east side. Ironically nothing appeared punctured in the pool’s cover or sides. Mostly the tops of the limbs hit the pool. It was another stroke of luck. 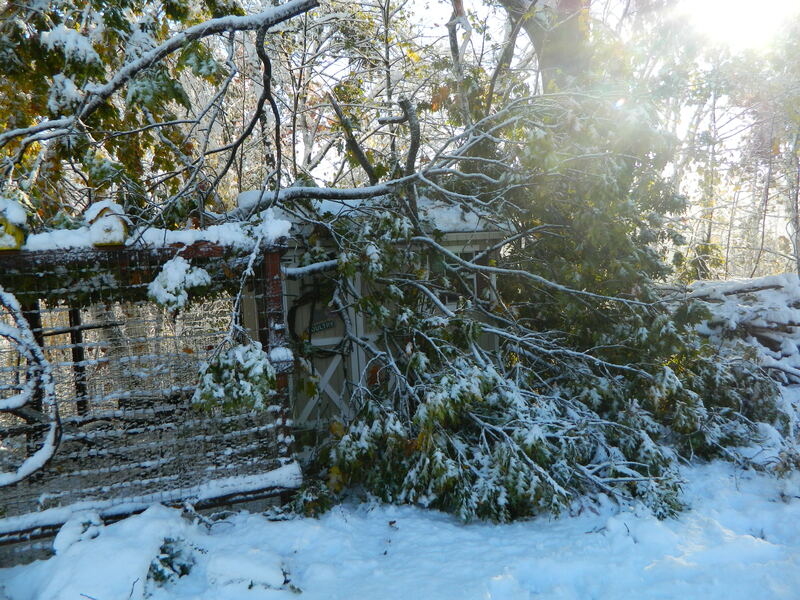 Our chicken-coop in the back, no longer housing chickens, was littered with oak branches, so much so that we could not see if any holes were made in the roof. A bit of damaged occurred on the outdoor pen part, but nothing too major. This chicken home is situated by a huge mature oak. Looking above, we could see more broken branches resting on other branches, just waiting to eventually fall. We would have to be careful here. 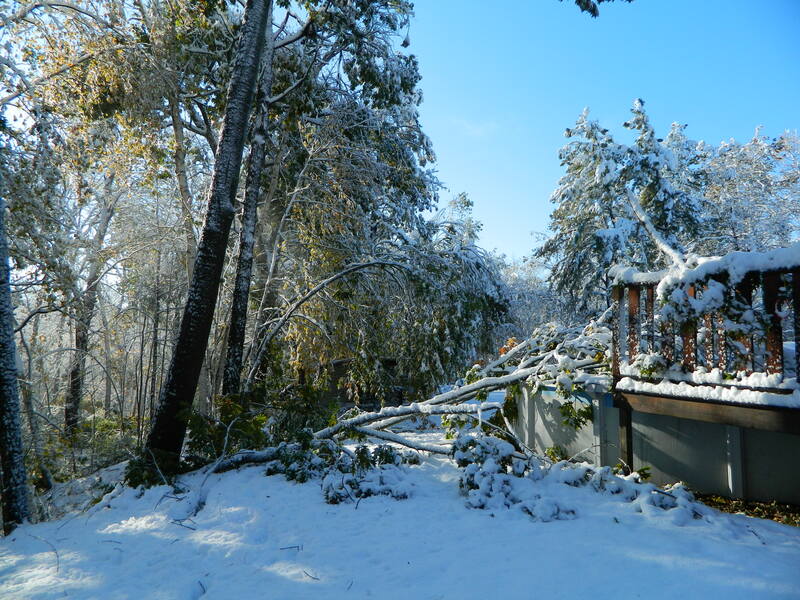 Continuing our inspection, we realized it was still very dangerous near the edge of the woodlands as branches continued to split and fall from the snow rapidly melting in the morning’s warming sun. It was rather pretty as the melting drops glistened and seem to wash away the tears of the trees. I wondered how the wild animals, such as the turkeys we see in our yard this time of year, dealt with the ordeal of the evening’s crashes. Where did they go for cover? And just as I thought about them, I started to the west side to inspect my two prized ornamental trees planted at the base of a slight hill in my backyard. 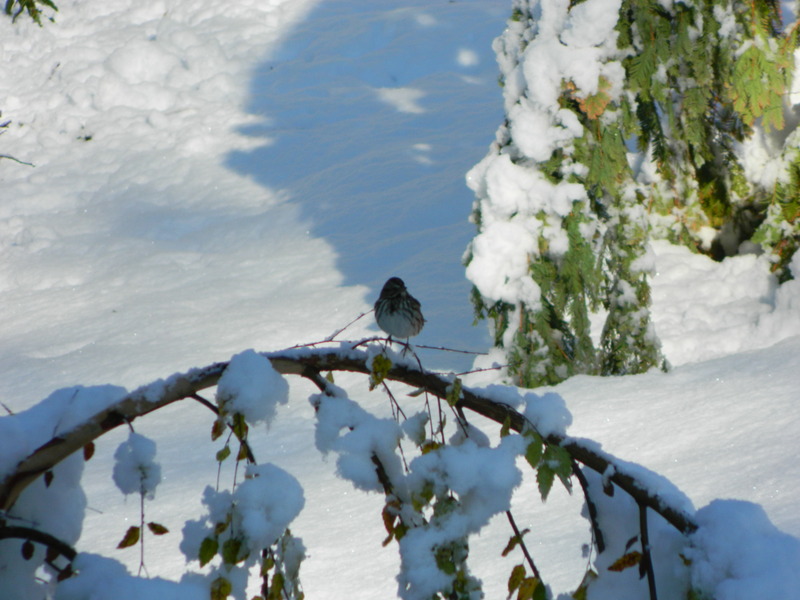 As I approached, a bird was perched on the curve of the bent over limb of my river birch. This Betula nigra ‘Heritage’ has been a favorite. I saved it from a badly root-bound situation in a small pot a few years ago at the end of summer from a local nursery. It adjusted to its new home of moist soil and thrived in the years following. It’s creamy like soft salmon colored bark – reminding me of the color of a creamsicle pop, is a feature to adore. And its sharply pointed and serrated leaves are also attractive and delicate. I was relieved to see that so far, there was no major breakage, and that I may be able to save it once again from the trappings of nature. But before doing so, I went to go look at my dawn redwood tree along the same ridge. This dawn redwood tree was planted in honor of my parents’ fiftieth wedding anniversary several years ago. I often joke to my friends when they visit that I planted it just so I could say, with an amusing tone, “Don’t you just love my Metasequoia glyptostroboides?” It has reached over twenty feet tall in my landscape with a pyramidal habit and feathery needles lined up as opposites along its stems and branches. So pleasant in texture yet grows up to an impressive seventy feet tall or more at maturity, providing a tall stature with unique reddish brown furrowed bark even more visible when the needles drop each winter – a sight many don’t expect for it looks like an evergreen fir tree but is deciduous. These two trees have made my landscape, and frankly my life, more pleasant because their peaceful grace offer tranquility in that space, plus the dawn redwood reminds me of my parents’ solid marriage of 50+ years. I did not want to lose it. My older sister, Lisa, had planted one too at her home in Granby, CT on the same day as I. We had shopped together at a nursery, and I told her about this unique tree. My plan was to allow the day’s sun to warm up the exfoliating bark and branches on both trees while hoping their central leaders would slowly rise to the skies again. A few more days’ patience would be required to see how they may react before taking action to correct their posture. Thankfully they survived their evening of torture, the birch faring a bit better than the redwood which has one tip dipping more than the other. Perhaps it would need the help of a splitter or some type of roping for more support. The tip was not torn, as with my sister’s tree, but other naturally growing pines and conifers in my woodlands did loose their central leaders. However, these could be fixed by taking an adjacent whorl to serve as a new leader with a splitter to redirect its growth. All of this would be done in time. For the rest of this day, more important tasks were at hand – like boiling snow water and figuring out a plan of action for food, warmth, and light. I had a feeling it would be a while before we would get any power back, especially because our house is situated far from the road. It was time to get busy, and check on our family and friends. Snowlloween may have passed but the after effects were just beginning for many in our area, and it was something I was sure none of us were totally prepared for.